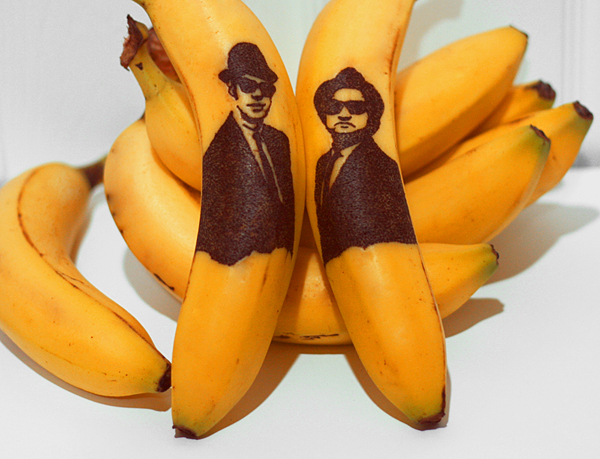 Designer and illustrator Honey emailed to suggest that serving tattooed bananas might be a good idea for a brunch party. Might be? Heck yes; I love this kind of craziness. Put them in lunch bags! Hide them in the produce section at the grocery store and giggle at perplexed shoppers! I had to try it immediately. Simply make lots of tiny punctures in the banana peel with a pin, and the holes will turn brown. (I drew a quick outline on the banana with a sharp pencil first, then filled it in.) The banana will start to turn brown immediately. The longer you wait, the darker the black becomes, and it starts to look a bit debossed. The heart is the result of 60 seconds of poking, then waiting overnight. The "hi" photo was taken half an hour after puncturing. See more of her work here. Wowzers. Except for the lettered versions, those are freehanded. You could also poke holes through a template printed on paper. Have fun, kids. You know you wanna do it. 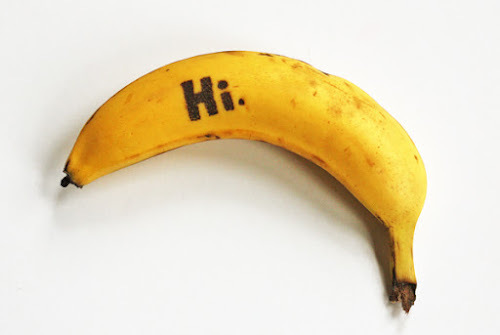 I worked at a Baskin-Robbins in high school and we used to write messages to our co-worker friends on the bananas! I plan to do the same for my kids, once they can read. Brunch is a super fun idea, though!! I love this! My mom used to draw on the bananas she packed for my lunch. I distinctly remember sitting in kindergarten and pulling out a banana with a big monkey face drawn on it, and laughing hysterically. Oh this is so good! I'm sending one in for the school fruit basket next week! Crazy! I have to try this. So I changed my shopping plans for the weekend. I'm going to do it in a minute and not tomorrow. Bananas, here I come! That is fun. very cute. I want to do this and leave it for a customer to find at work. Imagine their surprise as they shop for bananas! This is awesome! I'll have to try this out and see if my fiance notices. :) ha! I've seen people put temporary tattoos on them but never thought of this. My kids will love it! I wrote a little banana fairy tale on mine for the kiddos - worked like a charm. Thanks for the tip. This is one great way to get everyone to eat more fruit. 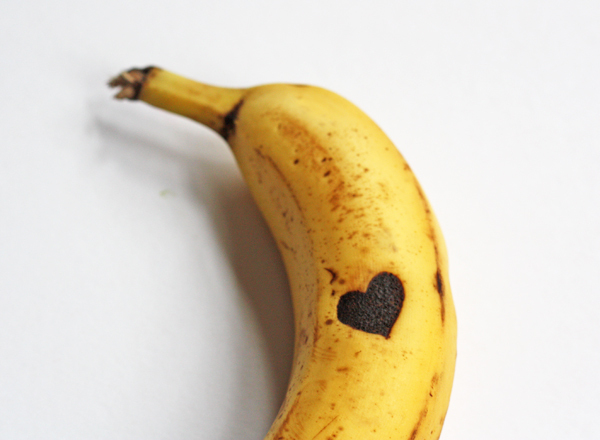 Hmmmm... Is anyone else wanting to tattoo the Virgin Mary on bananas at the grocery store? So fun! That is a hilarious idea. I always used a sharpie.... So doing this from now on! Way cooler!